Just a man and his box of chocolates. Kate McKinnon nailed her impression of U.S. Attorney General Jeff Sessions as Forrest Gump on the Saturday, March 4, episode of Saturday Night Live during the show’s cold open. 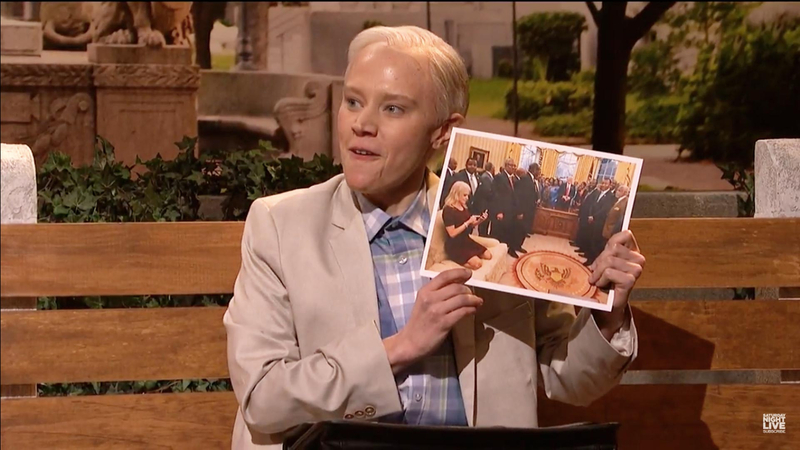 The scene opened with a white feather floating across the screen à la the iconic image from the 1994 classic, revealing Sessions (McKinnon) as the titular character in a tan suit with a briefcase on his lap. “Hello. My name’s Jeff. Jeff Sessions. Would you like a chocolate?” he asked his bench mate, played by a pink sweater–wearing Leslie Jones. When Jones’ character declined, the faux Sessions eagerly dug into the box and started to talk. The rest of the skit involved a whole host of characters, including passersby played by Kyle Mooney and Aidy Bryant, as well as a brief cameo by Vladimir Putin (Beck Bennett) and, finally, host Octavia Spencer in character as Minny Jackson from The Help. Watch the clip above to see how McKinnon’s Sessions reacted to the surprise gift (with a special ingredient, of course)!